Sealing tiles is recommended to prevent staining. Due to the low levels of porosity found in many tiles, it is suggested that a penetrating sealer such as a Tileguard Sealer be used. Normally it is polished tiles that require sealing as the polishing process can cause minute micro pores to appear at the surface. If your tile is made of stone such as slate, marble, or granite, then it will also need to be sealed. Stone is naturally porous and will absorb spills and stain fairly easily. You can often tell if your tile has already been sealed by spreading a few drops of water on them. If they darken or change colour, they are probably not sealed. If they stay the same, they may have already been sealed. There can be some exceptions to this, so it’s good to check with your tile manufacturer to be sure. Posted in Sealing Tiles, Tile sealant. Grout Sealers are a very important product to use on tiled areas as grout needs to be sealed. This is due to it’s naturally porous nature and therefore will stain quite easily. 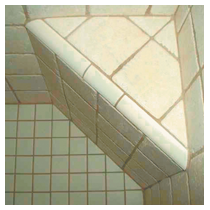 Sealing is done to strengthen the grout’s defences against dirt, spills, and erosion. You need to be aware that most installers of tile floors do not seal them, because grout has to cure first. After laying tiles, sealing is something you should do to keep your grout looking it’s best. Once this has been done, the sealed grout is much easier to keep clean. 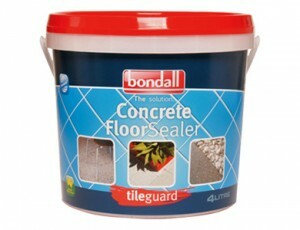 Try Bondall’s Tile and Grout Sealer. Posted in Grout Sealers, Information. 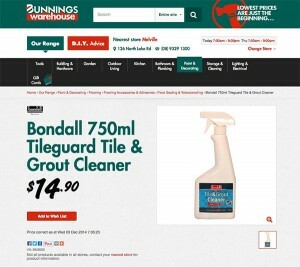 Bondall 750ml Tileguard Tile & Grout Cleaner is just $14.90* at Bunnings. It’s a powerful, fast working, ready to use cleaner ideal for most tiles and grout. It is a concentrated, biodegradable, water based cleaner which will remove grease, oil and grime deposits, all without damaging the surface of the grout. 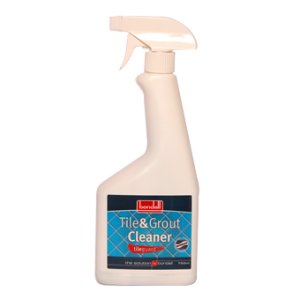 This 750ml Tileguard Tile & Grout Cleaner now comes as an easy to apply trigger spray pack, which will come in handy when applying around bathroom corners and in hard to get places. 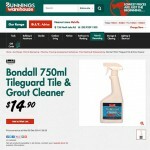 Find out more about Tileguard’s Grout Cleaner here and then head down to Bunnings and grab it for just $14.90 today. As a floor tile cleaner, Tileguard Tile and Grout Cleaner is a powerful, ready to use, fast working product. Removing ingrained dirt, grime, grease, and oil deposits without damaging the surface of the floor. Tile and Grout Cleaner is non caustic and non solvent based, unlike most common cleaners, making it safer for the environment. It is ideally suited for use on bathroom, laundry and kitchen floor surfaces. It is also useful for general purpose cleaning around the home or workshop. Additionally, Tileguard Tile and Grout Cleaner also effectively cleans the grout in between the floor tiles, which means no added cleaner is required. Posted in floor tile cleaner, tile cleaning products. Many chemicals and tile cleaning solutions including the weakest homemade varieties that work well on other types of tile can easily damage beautiful marble tiles, and unglazed stone and ceramic tiles can stain easily, so you need a reliable tile and grout cleaner. If you don’t think you can ever get your tiles clean or you’ve been using a lot of elbow grease and feel like you’re not achieving anything then Tileguard tile and grout cleaner can change that. Floor, wall and shower tiles get dirty for a lot of different reasons and by using Tileguard tile and grout cleaner, you’ll to get that pristine look without a lot of hassle. So even if you’ve got some pretty heavy-duty dirt, grease, ageing mildew, or long overdue uncleaned tiles, the results you want are easily achieved with this fantastic grout and tile cleaner. If you have a really tough cleaning job – which is often true of most kitchens and bathrooms – then Tileguard tile and grout cleaner can help you get the results you want. Ideal for heavy grout stains and that caked-on soap scum on bathroom tiles. Even with brand new tiles in a brand new home or whatever the age, location or style of your home’s tiles, Tileguard tile and grout cleaner will get your tiles looking beautiful. Posted in ceramic tile cleaner, Cleaners, floor tile cleaner, grout cleaner, porcelain tile cleaner. As a powerful, ready to use, fast working porcelain tile cleaner, Tileguard Tile and Grout Cleaner removes ingrained dirt, grease, grime and oil deposits without damaging the porcelain surface. Unlike most common cleaners, Tile and Grout Cleaner is non caustic and non solvent based, making it safer for the environment. It is ideally suited for use on porcelain surfaces in the bathroom, laundry and kitchen areas. It is also useful for general purpose cleaning around the home or workshop. As an added feature, Tileguard Tile and Grout Cleaner will also effectively clean the grout in between the porcelain tiles meaning no additional cleaner will be required. Posted in ceramic tile cleaner, Cleaners, floor tile cleaner, porcelain tile cleaner. 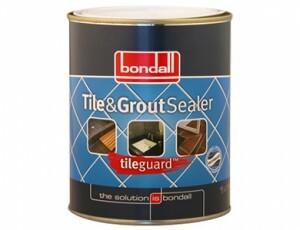 Sealing Tiles is easy with Bondall Tileguard Tile and Grout Sealer. Test on a small inconspicuous area to ensure that the sealer is achieving the desired result, and to ensure it does not discolour the tiles prior to application over the entire area. Before applying, remove any silicone sealant strips and soap build up and clean any mould from the tiles and grout with bleach or Tile and Grout Cleaner. Rinse thoroughly with water, after cleaning. Also remove and patch any loose or missing tile grout and for improved quality, use Bondall Hydrocrete as an additive in the grout. The application area also need to be dry for approximately 12-24 hours before applying Tile and Grout Sealer. Tile and Grout Sealer will treat approximately 5 square metres depending on the texture, porosity and method of the application. Application should start from the top of the wall, brushing the sealer liberally over tiles and grout. Finish with the shower or floor base. You’ll nee to ensure that Tile and Grout Sealer is applied thoroughly to all surfaces and allow at least 15 minutes for the ﬁrst application to react, before repeating the entire area. Allow another 15 minutes for the second application to penetrate then use a dry cloth to wipe oﬀ any excess left on the tile surface. Once finished, allow 24 hours before using. Posted in Applications, Bathroom tile sealer, ceramic tile cleaner, Floor tile sealer, Grout Sealers, Sealing Tiles, Tile sealant, Tile sealer, Tile Sealers.